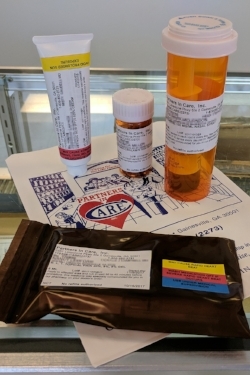 Partners In Care is a compounding pharmacy serving Gainesville, GA and surrounding communities. Caring for you like family is our goal! Our pharmacist has the training in bio-identical hormone replacement, men's health, pain management, wound care, veterinary compounding and endocrinology just to name a few. We answer patient's questions, make physician referrals and work with the physician to create a unique formulation to solve the patient's problem. These are just a few of the problems that can be solved by a compounding pharmacist. We care enough to listen to solve your problem. Don't know what compounding is? Find out more about our staff, what we do and where we're located. need a refill? fill out our refill request form and send it to us anytime. We'll let you know when it's ready. 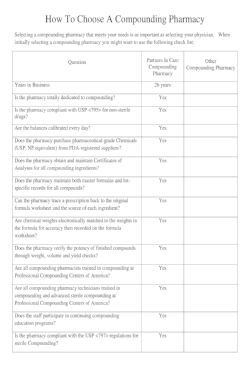 sELECTING A COMPOUNDING PHARMACY CAN BE DIFFICULT. USE OUR CHECKLIST AS GUIDE TO HELP YOU.